True cinnamon quills or sticks will be curled in a telescopic form, while cassia quills curl inward from both sides, like a scroll. Small pieces of the quills are known as quillings. Ground cinnamon is more difficult to distinguish from ground cassia. 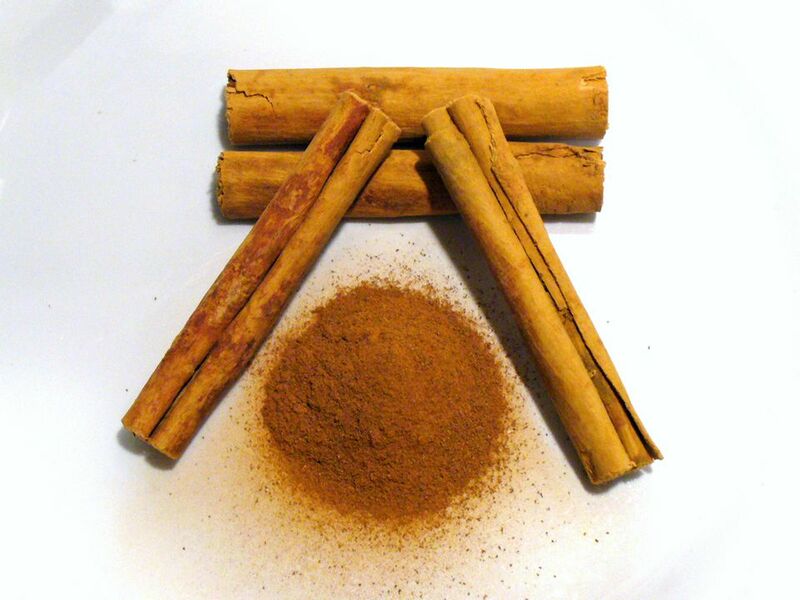 True cinnamon is tan in color with a warm, sweet flavor, whereas ground cassia is a reddish brown, usually coarser in texture, with a more bitter, stronger flavor and a more aromatic bouquet. Cassia comes in peeled and unpeeled quills, as well as ground. Store powder or quills (sticks) in an airtight container in a cool, dark place. It is best to buy small quantities of ground cinnamon as it quickly becomes stale, losing flavor and aroma. Grind your own from cinnamon quills using a spice or coffee grinder for best flavor or use whole cinnamon quills. Cinnamon and cassia both come from the bark of a plant in the laurel family which can grow up to 30 feet tall, but most farms keep them short and bushy to make harvesting easier. After three years, the bark is peeled from the trees during the rainy season and left to dry and ferment for 24 hours. Then the outer layer of the bark is scraped off, leaving the inner, light-covered bark, which curls into quills as it dries. Removal of the outer bark makes the cinnamon less biting and mellows the aroma. Cinnamon is well-known as a prime ingredient in many and baked dishes, but it is also an interesting addition to marinades, beverages,​ and dressings. In Mexico, cinnamon is added as a flavoring too. Most exclusive liqueurs contain cinnamon, as do various bitters. Cinnamon oil is pressed from cinnamon and cassia waste-products (usually the outer bark) for use in cosmetics and drugs.